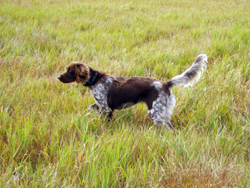 The Small Munsterlander, being a versatile breed, is a very intelligent, trainable dog that requires gentle and patient training skills with very good results. 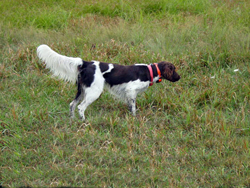 There are three long haired versatile hunting breeds, the Deutsche Langhaar (German Longhair), the Grosse Münsterländer (Large Munsterlander) and the Kleine Münsterländer (Small Munsterlander). Small Munsterlanders are about 2½ inches lower at the shoulders than the first two, larger breeds. They have a strong drive with a keen sense of smell. They can be very strong willed and the owner needs to be consistent with training. Small Munsterlanders have a love of water and a strong desire to retrieve. The Small Munsterlander can range from 35-50 lbs. in weight, and coloration is large patches of brown on a ticked or solid white background. The soft medium coat does require grooming after hunting. They are known to be slow maturing dogs. Additional breed information for the Small Munsterlander can be found at the American Kennel Club Website.